Nordschleife is more than 22km long with 187 corners of varying speeds as well as bridges, inclines and long straights – perfect for putting the most amazing sports cars through their paces. 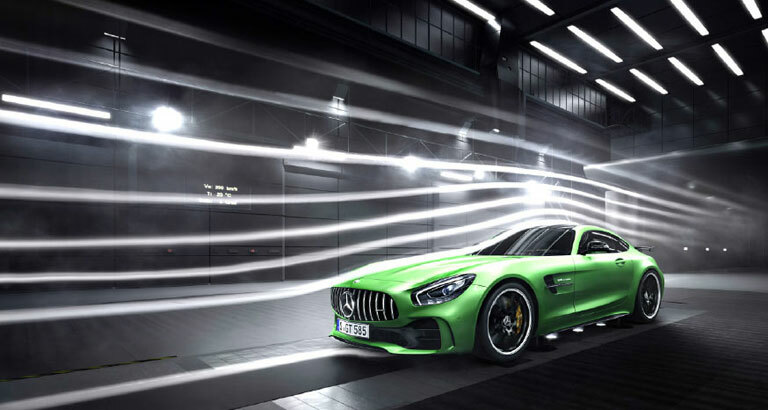 It’s only fitting then, that Mercedes AMG packed so much motorsport technology into the new AMG GT R. In fact, the exclusive ‘AMG Green Hell Magno’ special paintwork leaves no doubt as to the sports car’s origin, having spent most of its development time at the Nurburgring racetrack. “We have defined every single component dedicated to performance. The result is an overall composition that perfectly reflects our motto: ‘handcrafted by racers’. Developed straight from the racetrack on to the road, this unstoppable machine is a car you need to experience first-hand,” says Imran Sakhawat Ali, marketing manager, Al Haddad Motors. The front-mid-engine concept with transaxle, the twin-turbo 585bhp V8 engine, the extensively modified suspension, the new aerodynamics and the intelligent lightweight construction laid the foundations for a dynamic driving experience. This beautiful beast makes the dash from 0-100kmph in just 3.6 seconds and can reach a top speed of 318kmph. Drivers can tailor the car to their personal preferences using the AMG Dynamic Select controller. Various modes are available: ‘C’ (Comfort), ‘S’ (Sport), ‘S+’ (Sport Plus) and ‘I’ (Individual). The “RACE” mode optimally adjusts the shift strategy of the dual clutch transmission to the needs of racetrack usage. The interior, unsurprisingly, is also inspired heavily by motorsport. The low seat position integrates the driver into the cockpit and extremely light, manually adjustable AMG sports bucket seats come as standard in GCC markets. Alternatively, tried-and-tested AMG performance seats can be ordered as an option at no extra cost.